Labels is the third full length show from Worklight. 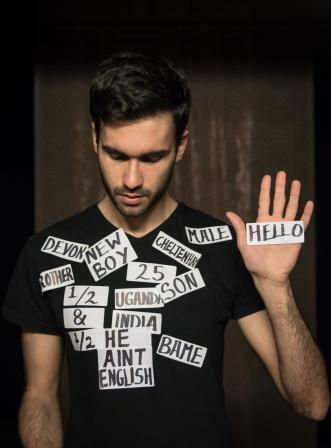 This one man show, written and performed, by Joe Sellman-Leava, explores multi-culturalism, immigration, and heritage, and the labels we place on one another and why we do so. Sellman-Leava talks about his mother being a wonderful storyteller, which must be where he gets it from, the 60 minutes of the show flew by with pace and professionalism. The piece is incredibly provocative and discusses important and urgent issues, though as an audience we were never made to feel patronised or preached at. There’s an honesty and boldness to Sellman-Leava’s performance, the autobiographical quality of the piece continuously bought the story back to a personal level, with thoughtful portrayals of his family members, as well as recognisable politicians and celebrities. One of the first sections of the piece sees Sellman-Leava performing various quotes on immigration as he masterfully melts from Enoch Powell, to Katie Hopkins, to Ed Miliband, to Nigel Farage to name but a few, in a slick and precise manner. Initially humorous and comic to see him morph so easily into some laughably ridiculous human beings, the message behind these quotes is hammered home in three separate repetitions throughout the show, and leaves a very real and unpleasant taste in your mouth that we have become accustomed to this sort of clowning and bafooning to make racism and labelling acceptable. The impersonations and character depictions are impeccable and strong, and showcase Sellman-Leava’s talents as a truly brilliant performer. A simple set, intimate bunker performance venue, and home-made props give the show a playful, patchwork style- the inside of the old brown suitcase used, had beautiful attention to detail echoing moments of the show and reminded me of Peggy Patch’s peg board from the 90s childrens programme- Playdays. There’s a wonderful interactive element to the show peppered with audience involvement, including a girl being brought up on stage with Sellman-Leava after a sudden burst of light into the audience to talk about Tinder, and the digital-self verses the real self- exploring the idea of self-editing for approval. I would have liked for the second and third rows of the audience to be involved more, but found it just as lovely to watch the first row, particularly as they were being coached by Sellman-Leava to create RAF paper planes with childlike fascination, showing how adept Sellman-Leava is at holding an audience entirely in the palm of his hand. There is a soliloquy in the second half of the show from Sellman-Leava’s father which had a spoken-word like rhythm, building in tension through rhyme, sharp and precise movement, and the adopted boom he gave to his father’s voice made a stark contrast against the softness of his usual delivery. Not only the industry, but the world, needs more thought-provoking new writing like this show. The simplicity of the set makes the show ideal for touring, and I hope its outreach continues to spread to as many audiences as possible. Relatable and evocative, Labels charmed and enraged me, looking at the prejudice and fear in our society, I was left with a genuine urgency to stand up and do something now. Eleanor Dillon-Reams is a writer, dancer, actress, and avid theatre goer originally from Brighton. She is passionate about the classics but also relishes the opportunity to support new writing whether that be through performance or as an audience member. With experience in all genres of theatre from musicals to physical theatre, to shakespeare, to spoken word, she is continuously interested in seeing and experiencing as many different varieties of performance as is out there!